The narrow road on the left is the only way those of us cut off from the village of Gorbio can get to and from Menton. I took this photo my way home from Menton yesterday morning and already these guys have removed a ton of mess. It was far worse when I drove in the opposite direction earlier. The road is called the Col de Garde and is very narrow, covered in mud and fallen rocks and trees from the recent rains but at least it's passible so long as you watch out for the enormous pot holes. and of course any oncoming cars and trucks. 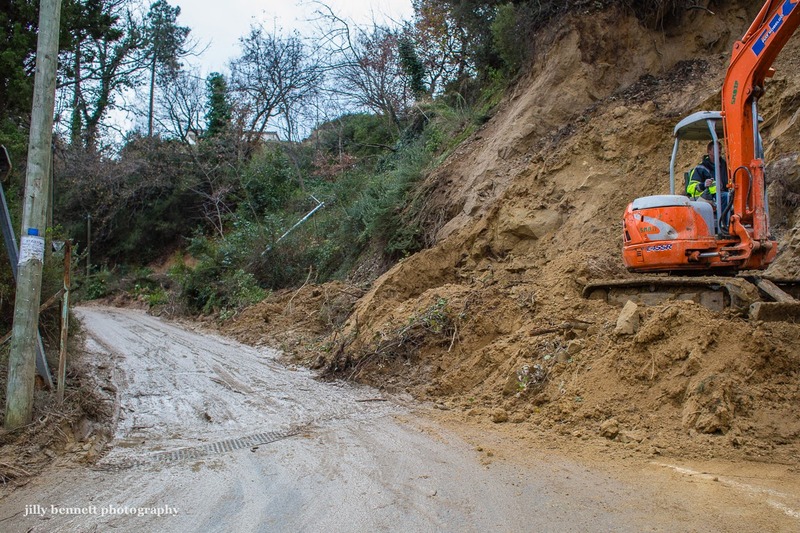 Hopefully the main Route de Gorbio between where I live and Menton will be open soon. The road to the village will be closed though for approximately three months. A nightmare for those who live in the village. Difficult for all of us but a disaster for the poor people who have destabilised homes and falling land, verandas and pools and have had to leave their homes. L'étroite route sur la gauche est l'unique voie permettant d'aller à Menton et d'en revenir pour nous qui sommes dans la vallée de Gorbio. J'ai pris cette photo en rentrant chez moi depuis Menton, hier matin, et déjà ces gars avaient enlevé une tonne d'éboulis. C'était bien pire plus tôt quand j'étais passée à l'aller. 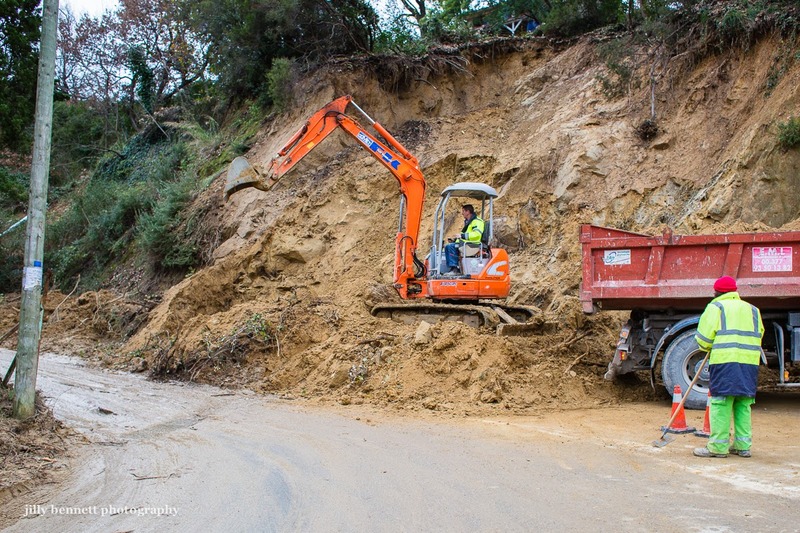 La route qui s'appelle route du Col de Garde, est très étroite, couverte de boue, de rochers et d'arbres tombés à la suite des récentes pluies mais au moins c'est un passage possible à condition de ne pas tenir compte des nids de poule et bien sûr de toutes les voitures et les camions venant en sens inverse. Espérons que la principale route de Gorbio, entre l'endroit où j'habite et Menton sera réouverte prochainement. En revanche, cette même route en direction du village restera fermée pendant environ trois mois. Un cauchemar pour ceux qui vivent dans le village. C'est difficile pour nous tous, mais c'est un désastre pour les pauvres gens qui ont dû quitter leurs maisons déstabilisées, leurs vérandas et leurs piscines emportées par des glissements de terrain. Disastrous indeed, Jilly. And sad. And annoying, too, I suppose. But no lives liost, hopefully. Around Menton, everyone lives in the hills. Everyone needs a car = needs gasoline, a road, a place to park the car. While the gasoline part has been stable over the last 40 years, here we have a case of "missing road". During my visits to the Cote d'Azur I sometimes experienced "no place to park the car". Life in the hills is not easy. I guess the footpath up to Gorbio is in even worse condition and nobody working on it. Julie, no human lives lost in our area - but sadly a beautiful donkey died. In the Var lives were indeed lost. Boy from the Beach, amazingly the donkey track is barely damaged. I walked it the other day. There is only one fall and it doesn't stop us using the track. They knew how to build things in those days. Having said that the walk from Gorbio to Agnes is no more. There's a heavy fall across it. Sorry to hear it, Jilly. There are areas around us with only one road in, one road out--scary when we have fires or floods, and we do have both. It is such a pain when Nature shows who's boss.